Spacecraft 107, alias Apollo 11, alias "Columbia." The Best Ship to Come Down the Line. Michael Collins' inscription inside Columbia is further discussed as part of this topic describing the inscription left by the STS-132 crew inside space shuttle Atlantis. I have a clearer shot of the Apollo 12 inscription on my website. This was not intended as an inscription, but it certainly serves as a testament to endurance. This is part of a NASA post-flight inspection photo showing the Ground Elapsed Timer section of the Gemini VII control panel. 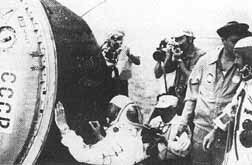 Borman and Lovell have tabulated the completion of each day of their historic 14-day mission, with exclamations of relief and triumph at the end. Unfortunately this sub-panel is inverted in the current display at NASM Udvar-Hazy Center, with the Ground Elapsed Timer rotated to display correctly. Does any reader know when Conrad, Gordon and Bean made the inscription on the command module? The design and paint color in that photo looks so much like a US Navy ship. Does anyone have a photo of Cooper's drawing inside the Gemini V spacecraft? Here is another, but for Apollo 7/CM-101; "Good Show, Wally Schirra (signed)." The Apollo spacecraft inscription asked in a prior post for Apollo 12 was already noted by LM-12. I've got one or two more that I'll have to locate and report back as time permits. I would love to see more post flight cockpit pictures of the capsules. Any idea where to find them? Apollo-Soyuz Test Project cosmonauts Alexei Leonov and Valery Kubasov signed their Soyuz descent vehicle after landing in 1975. Have any recent Soyuz crews done that? The inverted panel can be seen in this 360-degree panoramic view of the Gemini 7 cabin on the NASM website. Which astronaut signed his launch vehicle and added "Launch This Way" with arrows pointing to the nose? That was Gordo Cooper on his Mercury 9 Atlas rocket. Cal Fowler, a Mercury test conductor, signed below and added 'OK'. The small white circle on the side of the MA-9 Atlas launch vehicle is a "Project Mercury General Dynamics / Astronautics" sticker. I believe that is where Gordon Cooper and Cal Fowler signed it. Wally Schirra may have signed his Atlas launch vehicle also. I see a small white circle on the Atlas just before the body transitions into the truncated upper section. Is that what you're referring to as a sticker? I have a Mercury General Dynamics sticker that was removed from John Glenn's Atlas by a technician, but have never been able to determine its location on the vehicle. Yes, about at the level of "NI" in United States. A Project Mercury General Dynamics sticker can be seen in a slightly different location (higher) on John Glenn's MA-6 Atlas launch vehicle in photo S62-00380. Thanks for the photo. I guess there were many GD stickers on the Atlas, mine was removed from the thermal blanket surrounding the engines. Some stickers with the Project Mercury General Dynamics logo can be seen on the three engine covers in this photo. I believe that is MA-9 Atlas 130-D.
Two photos of Astronaut Leroy "Gordo" Gordon Cooper, Jr. and Cape Canaveral Air Force Station Launch Complex 14 launch manager Calvin "Cal" D. Fowler signing the Atlas rocket, which would launch Faith 7 into orbit. Cooper and Fowler were at the General Dynamics/Astronautics factory in San Diego, California, to accept the Atlas booster. Photos are from the private collection of Dr. Calvin "Cal" D. Fowler. A press release confirms Cooper and Fowler's attendance, and Cooper's signing of the launch vehicle. Photo 63-MA9-56 shows the Atlas 130-D launch vehicle arriving at Cape Canaveral in May 1963. The photo is not reversed, so it also shows a second sticker on the opposite side of the Atlas from the one that was signed by Cooper and Fowler. There is a chalked inscription left on the recently landed Soyuz capsule "Mironovu K.B. (or V.)na pamiat", meaning "K.B. Mironov to be remembered." The photo is available on the www.energia.ru webpage. Somebody may know whom the ISS crew meant, most probably somebody passed away recently ? Photo of Gordo Cooper placing the Project Mercury sticker on the Atlas rocket. Hadn't seen that one before. Compare with this MA-9 Atlas photo dated March 19. The caption says it was signed by Alan Shepard also. Shepard was Cooper's backup. Fowler signed the skin of the launch vehicle. Not sure if he signed the sticker also. Cooper signed both. ASTP cosmonauts Alexei Leonov and Valeri Kubasov signed their Soyuz 19 descent vehicle after landing in July 1975. It looks like Leonov wrote an inscription above his name. Can anyone translate the word? 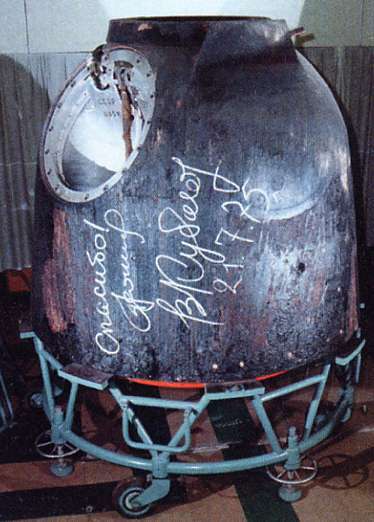 That inscription on the Soyuz TMA-19M capsule looks very smudged, like someone tried to rub it off. After seeing the landing photos sequences from various sources I think now that the inscription was left there not by the ISS crew but by someone from the ground crew personnel servicing the ship after landing. The inscription was obviously made after the ship was put to the upright transport-ready position and by that time the ISS crew was probably away already. I sent the inquiry to the Energia trying to find out who was "Mironov," still waiting for the reply. 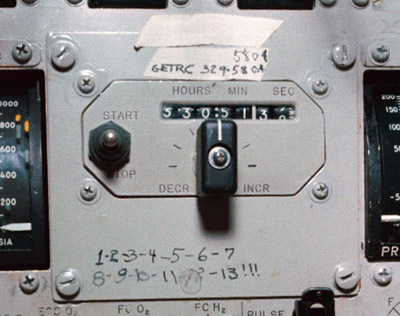 It seems the Apollo 12 crew signed and inscribed the attitude indicator instrument on the main display console in CM-108. It looks like the inscription reads "Yankee Clipper sailed with Intrepid to the Sea of Storms Moon November 14th 1969." The inscription on the outside of the command module below window number 2 (mentioned earlier in the thread) has the same wording as the interior inscription, except it says "Ocean" instead of "Sea" of Storms. Pete Conrad shows the inscription on the attitude indicator during the transearth coast news conference on Flight Day 9. Looking for some footage of that. CDR: No, it says, "Yankee Clipper sailed with Intrepid to the Sea of Storms, Moon, November 14, 1969." CC: Roger; we can read it now. Thanks. CC: And we copy the signatures. CDR: And that's it, Jerry, from Apollo 12, good night. We'll be talking to you tomorrow morning. The crew signatures on the attitude indicator can be seen briefly in some of the 16mm onboard film footage. The caption for Expedition 48 photo NHQ201607020006 seems a bit confusing. Kate Rubins (who launched on Soyuz MS-01) is signing a section of the Soyuz TMA-20M booster after it launched? I don't get it. 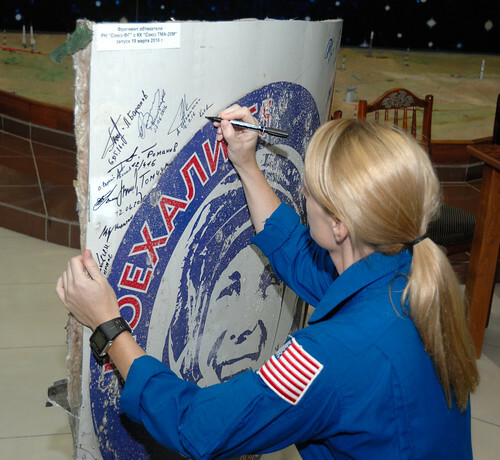 NASA astronaut Kate Rubins signs a section of soyuz TMA-20M booster that carried Expedition 47 crewmembers to space back in March of 2016 as part of her prelaunch activities with Russian cosmonaut Anatoly Ivanishin of Roscosmos, and Japanese astronaut Takuya Onishi of the Japan Aerospace Exploration Agency (JAXA) Saturday, July 2, 2016 at the Baikonur Cosmodrome Museum in Kazakhstan. Rubins, Ivanishin, and Onishi will launch from the Baikonur Cosmodrome in Kazakhstan the morning of July 7, Kazakh time (July 6 Eastern time.) All three will spend approximately four months on the orbital complex, returning to Earth in October. The fairing was recovered as debris after it launched and fell to the ground. The booster had been specially marked for the 55th anniversary of Gagarin's flight, hence the interest to retrieve it as an artifact and have it signed. The Gagarin logo was also on the Soyuz MS-01 launch vehicle. 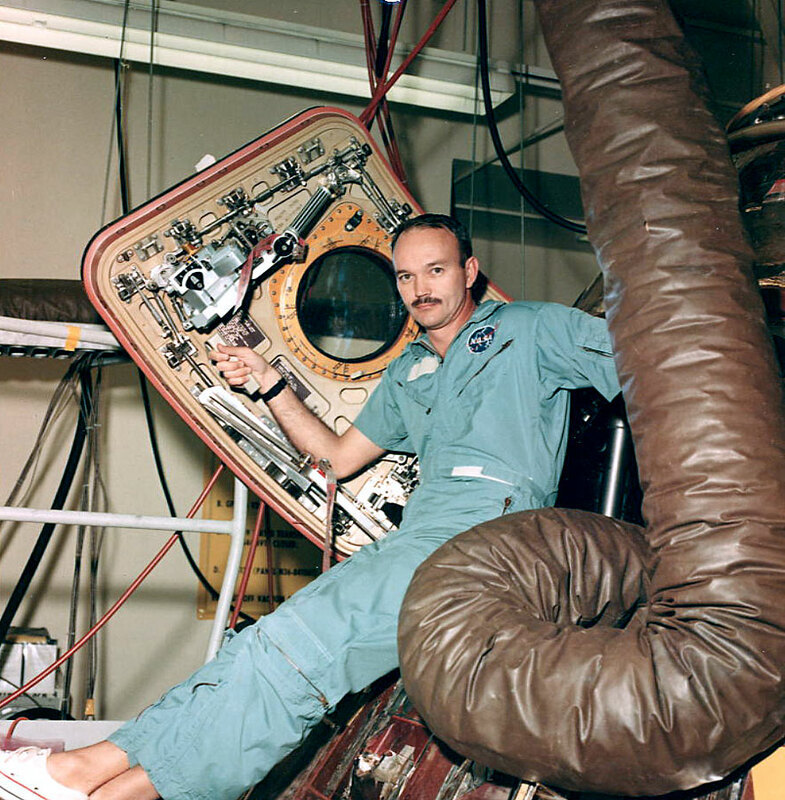 Apollo 11 photo S69-45495 shows Michael Collins at the command module in the Lunar Receiving Laboratory. When did he write the CM inscription? The book "After Sputnik" mentioned in an upthread link says he wrote the note in the CM on the USS Hornet on the way to Hawaii. I do recall them coming into the spacecraft area, and [Michael] Collins had signed the spacecraft because he was in Command Module Pilot. He did put his signature on it while it was inside the Lunar Receiving Lab. If you look carefully at the inscription you can see that it has been overwritten at least once. I've spoken to Mike Collins about his recollections and John's comment. He does recall reentering the command module thinking that his original inscription needed to be enhanced. It may well be that both recollections are correct. Thank you for that additional information, Allan. The inscription was a nice gesture by Mike Collins. It reminds me of what he said during the transearth coast TV transmission the day before re-entry. In the Gemini 4 spacecraft, there is an "American Eagle" tag on Ed White's FDI (Flight Director Indicator) on the instrument panel. Was it put there by the crew? The tag is not seen on the FDI in launch day photo KSC-65C-3507 taken at Pad 19 in the White Room shortly before the crew entered the Gemini 4 spacecraft.